SAN ANTONIO — Confidence anchored Marquis Dendy and Jenna Prandini in the right mindset where they could visualize themselves in the position they were in Thursday night. Natural talent allowed Dendy and Prandini to stand out from their peers during the 2014-15 collegiate track & field season. 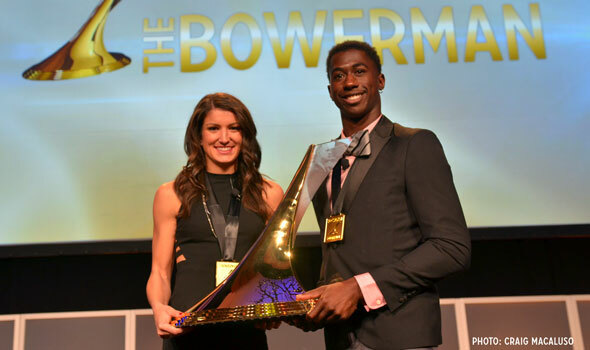 Hard work made the 35-pound trophy feel light in their hands as they cradled The Bowerman inside the Grand Oaks Ballroom at the JW Marriott San Antonio Hill Country Resort and Spa. Dendy and Prandini captured college track & field’s biggest honor as part of the U.S. Track & Field and Cross Country Coaches Association (USTFCCCA) Convention. The announcement ended more than four months of questions as to whether or not Dendy and Prandini had done enough to warrant the voters’ utmost respect. Safe to say, mission accomplished. While Prandini’s fellow finalists — Kentucky hurdler Kendra Harrison and Stephen F. Austin pole vaulter Demi Payne — owned impressive resumes, one look at what the former Oregon standout did erased all doubts as to her claim to the throne. Prandini, who became the fourth Oregon athlete to win The Bowerman since its inception in 2009, scored an incredible 49 points between both NCAA championship meets (23 indoors, 26 outdoors). If Prandini ran unattached at NCAA Outdoors, she would have tied for 11th place with LSU based on how she fared in her four events (100 meters, 200 meters, 4×100 relay, long jump). For Dendy, Thursday’s result was a byproduct of a pledge he made at the end of the 2014 campaign. Dendy, then a junior, had just won two NCAA titles (long jump and triple jump), but he wasn’t content. Seek (the titles) and destroy (his foes): Dendy did just that. Dendy swept through the track & field season and added four more NCAA titles to his trophy case. He also became only the second triple jumper in NCAA history to surpass 57 feet at both championship meets since future Olympic champion Mike Conley in 1985. Olympic medals — specifically gold ones — are in Dendy’s sights now. Well, Dendy is in some great company if he wants shine on the biggest stage. Since 2009, Bowerman winners have nabbed four medals at the Olympics: Ashton Eaton (Gold, 2012, Decathlon); Galen Rupp (Silver, 2012, 10,000 meters); Derek Drouin (Bronze, 2012, High Jump); Deon Lendore (Bronze, 2012, 4×400 relay).